It’s the 4th of July and there is a strong chance you will be at your grill today. Burgers, dogs, maybe ribs or chicken. Why not dessert, too? From Emeril Lagasse, actually a friend of his from Tennessee, here’s a rather wild idea. Grill apples that have been cored out and filled with chopped up candy bars and butter. 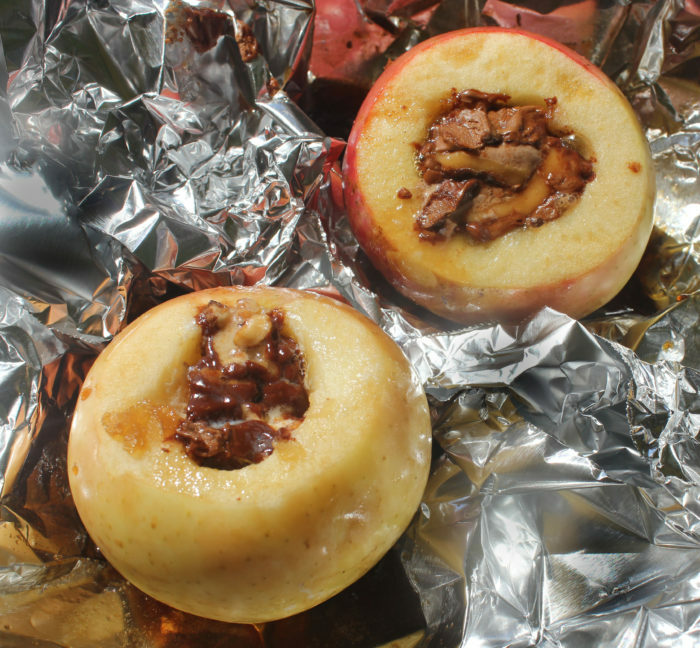 For some moisture while you grill the foil-enclosed apples, some apple juice + sugar provides steam and sweetness. This is a lovely surprise for the end of your meal. Add a side of vanilla ice cream for just a hint of holiday decadence. Using a sharp knife, carefully cut the top ½ inch from each apple. Using an apple corer or a small melon bailer, scoop out the stem, core, and seeds from each apple, leaving the bottom intact. Fill each apple with about 2 tablespoons of the chopped Snickers and top each apple with 1 ½ teaspoons of the butter. Combine the apple juice and sugar in a measuring cup and stir until the sugar has dissolved. Place each apple on a piece of aluminum foil and pull the sides up (so the apple juice mixture will not leak out). Spoon 3 tablespoons of the apple juice mixture over each apple, bring the foil edges together, and seal the foil packets tightly. Place the apples on the grill, close the lid, and cook until tender, 15 to 20 minutes. Let the packets rest briefly, and then carefully open them. Transfer the apples to shallow bowls. Pour any accumulated juices over the apples and serve hot, with a scoop of vanilla ice cream if desired.